The home is located in Paradise Estates, a laid-back community by Mt. Rainier. 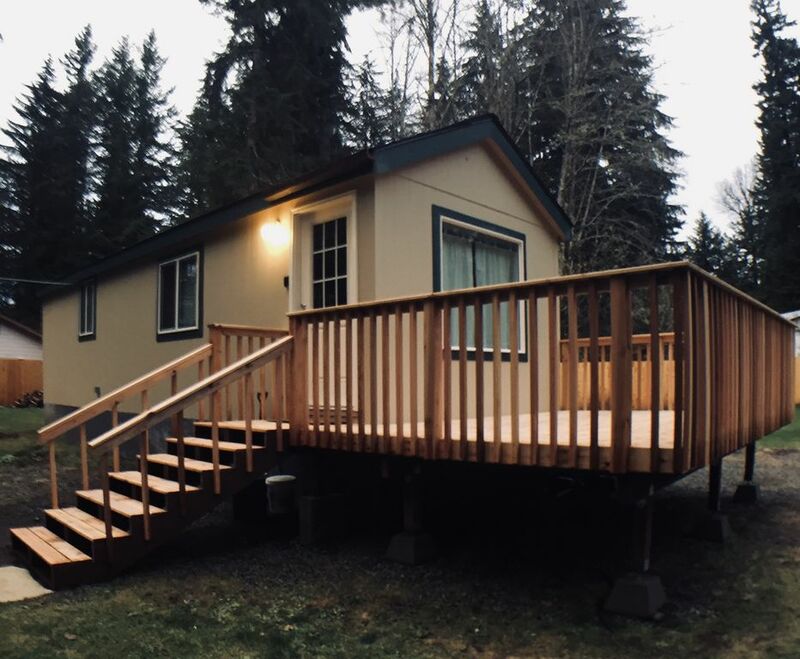 Our small home is about six miles from Rainier National Park and even closer to the Nisqually River. Enjoy the stunning views of Osborne Peak right outside the front window, or while grilling on the spacious porch. Outdoor enthusiasts love our home because of access to Rainier and hiking trails. Indoorsy folks enjoy the relaxing ambiance and seclusion. Cook your favorite meal in the full-service kitchen and end the day with a glass of wine around the cozy firepit! You won't want to leave. The home is located in Paradise Estates, a laid-back community in Ashford. Try all the local eats like the Highlander (you'll see all the mountain guides here during Rainier season), the Wildberry Restaurant for Himalayan fare, and Copper Creek Restaurant for the town's best burgers. Guests have access to the entire home and all parts of the property, including the outdoor firepit and hammocks. Note it is a small home--about the size of a comfortable studio apartment--and has a shower, not a tub. We do not interact with our guests in-person but are available anytime through phone or text with any questions. This is our beloved second home, so enjoy your stay as if it were your home also. Greg is in the outdoor industry and JoLee is a bit more corporate. We travel the world together, one adventure after another. We look forward to sharing our second home with you - enjoy! The home is set on a high plateau, giving you great views of the surrounding neighborhood and Mt. Osborne, which makes this property unique. Of course, great hiking is steps away, and Mt. Rainier National Park's entrance is six miles away. The views are stunning! The firepit keeps things cozy. The fence keeps your stay private. Loved the location of the property, perfect for two. We were out and about enjoying the National Park most of the day but this was the perfect home away from home to come back to each day. We didn't do a lot of cooking but found the kitchen to have what we needed. The place was clean and inviting from the moment we first stepped in. Thank you for sharing with us! The Ashkicker is the perfect retreat for anyone looking to spend time at Mt Rainier National Park. My wife and I spent 2 days of our honeymoon there. The house had more than enough things we needed ie full kitchen, games, hiking recommendations, and etc. The drive to the entrance was very short and approximately only 3-4 miles away. If you stay at the Ashkicker, you’ll be a very short distance away from the wonderful Copper Creek Inn (our best meal on the honeymoon). Enjoy! Paradise Estates was the perfect cozy, comfortable cottage for our hiking trip in Mt. Rainier. The little cottage is clean and updated. It's perfect for two people who need a landing spot in the evening for daytime adventures. We enjoyed eating our dinners on the small front porch. The house is away from the main roads but close enough to the National Park for daily trips in for hiking. It's small, as described in the listing, but fairly well-equipped. We'd definitely stay here again! Nice accommodation close to Mt Rainier! Great space for 2 people close to Mt Rainier National Park! The owners provided lots of tips ahead of our reservation date and were very responsive to questions after check-in, which we appreciated. We loved the deer that roamed through the property in the mornings & evenings. The house was very clean, but we could have used more than one sharp knife in the kitchen. Loved the deck! Small but cosy place in a quiet natural setting. Close to Mt Rainier entrance. My husband, 8-month old son, and I stayed two nights in this great little one bedroom retreat near Ashford. It was perfect for our needs. We needed a place to set up all our baby gear for meals, sleep, etc. for when we weren't exploring Paradise, Longmire, and the beautiful scenery in between. Good selection of cookware, dishes, and a few staples like tea, coffee, salt, pepper. Grocery stores in town, and we took the owners' advice about picking up groceries in Puyallup on the way. Thanks for providing a relaxing place to stay while we tried our wings at the whole travel-with-baby stuff!